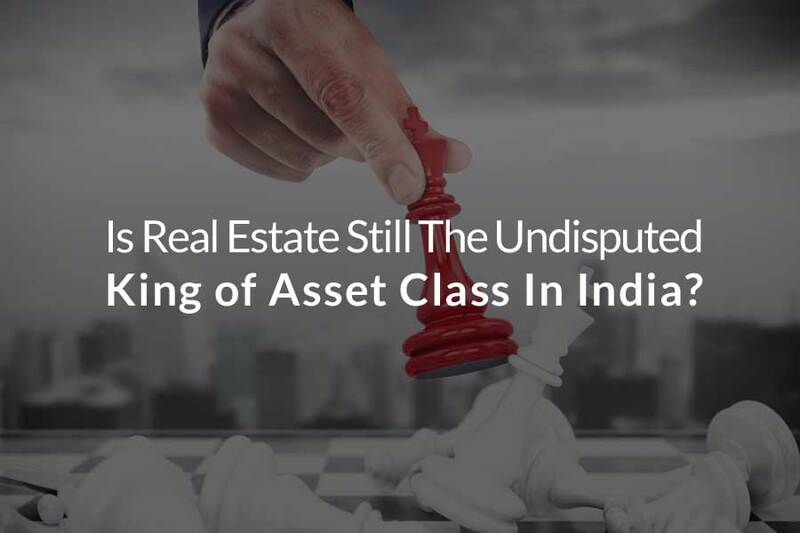 Indya EstatesBlogReal EstatesIs Real Estate Still The Undisputed King of Asset Class In India? Is Real Estate Still The Undisputed King of Asset Class In India? The real estate in India business saw plummeted sales for a while in the recent past. But there is hope now. Modi government came into power and things started moving in the right direction for the industry considering couple of significant policy changes proposed by the new government. Modi government announced few mega missions which were meant to bring some significant changes. Smart cities were announced. Central government has ambitious plans to turn 100 cities into smart cities. These handpicked cities will receive 500 crore each from central government to improve the infrastructure. Considering the fact that India is witnessing rapid urbanization, India needs to have world class cities to accommodate the population which is constantly migrating from villages to the cities. The government has also declared the Housing for All by 2022 scheme. These schemes are expected to fuel the growth of Indian cities. Yes, things are beginning to look positive for the real estate sector in India. But does that mean that real estate sector is still regarded as the top asset class today? Well, we have to consider several factors to give a proper answer to this question. In a closer inspection of the market scenario, we can see that the real estate industry has its own demons to deal with. High home loan interest rates, project delays and increasing property prices are the main reasons behind scepticism in the minds of investors who are sitting on the fence. Indian real estate portal, CommonFloor.com conducted a comprehensive survey in 2016 to find out the real mood of the market. The survey titled, “REAL ESTATE CONSUMER OUTLOOK: H1 2016 – A CommonFloor Survey” gives a clear picture about the days to come. Let’s jump right into it. When it comes to an average investor in India, they tend to focus their energies on mutual funds, stocks, fixed deposits, gold and real estate. But with ever changing market, it is difficult to assess the ruling asset class. Real estate used to be the top asset class for investment for a long time. Consumers have been showing tremendous interest towards the investment in real estate. Yes, the survey reiterates the fact that real estate is still the reigning king. Reduced interest on home loan and never ending demand for home has resulted in this scenario. It’s time to go little deeper to learn more. Indeed, real estate is the first choice for all the investors. But there is tight competition for the second spot. For instance, mutual funds took second place in Bangalore, where 20% voted for it. But fixed deposit took the second spot in the case of cities like Pune, Chennai, Mumbai Metropolitan Region and National Capital Region. Fixed deposit has been the traditional choice and it continues to be a force to reckon with. We have stocks in the 4th place. We can understand why – the Sensex has been scaling new heights of late. Interestingly, it maintained the 4th spot in all the surveyed cities. Gold, on the other hand, seems to be losing the plot. Several macro-economic factors have been the reason behind the shaky performance of gold. If you wish to know the major factors, then we can take zero regular income and no tax benefits. Investors find it less attractive due to these factors. The survey has unveiled the unwavering interest for real estate. More than half of the responders said that they are open to invest in the real estate sector. And that tells a lot about the prospectus of real estate. But when asked whether they have bought houses, the answers were less optimistic. They are all interested in doing so. But most haven’t done it yet. What could be the reasons behind it? First and foremost, responders complained that investing in real estate is always a time consuming process. Interestingly, most of them said that they would like to invest in real estate as soon as possible. What we derive from this is that there is positive buzz surrounding the investment prospectus of real estate in India. Is it going to stay here? That time only will tell. As per the same survey, close to 43% in Bangalore did not invest at all. But 36% is seriously thinking about buying a property within a year or so. And 21% have said that they managed to clinch a good deal. What about the other cities? It’s pretty much the same in cities like Pune, Mumbai Metro Region and Chennai. Majority have said that they have plans to buy a property in the near future itself. The common theme of the above mentioned survey is that most of them are holding back. What could be the reasons behind it? First and foremost, buying a home is not a simple decision. It’s one of the life-altering decisions for most people. The stakes are high when it comes to buying a new house. Amenities, BHK, project, location andbudget are some of the concerns for the investors. Potential buyers don’t want to make a decision if they are not sure about these factors. They all go for the wait and watch approach. But pushing these buyers on the fence into making a decision is the key to the growth of the industry. So, consumers were asked about the things that bother them regarding this decision making. Well, consumers have spoken! And they say in unison that they are waiting for prices to go down!. But in the case of National Capital Region, lack of relevant guidance, construction delays and job uncertainty also played their part in these delayed decisions. Or in other words, there is no fixed reason behind it. Budget has to be the most crucial factor that leads to this decision. People have spoken about their budget constraints. For National Capital Region, Pune and Bangalore, the preferred budget is 40-70 lakh. When we take a closer look at the data available, we can see that close to 70% of them had a maximum 70 lakh budget. When it comes to Chennai and Mumbai Metropolitan Region, most of them prefer maximum budget to be Rs. 40 lakh. And that indicates that investors in these cities prefer affordable housing with basic amenities. Most of them are not into luxury housing. Maximum 40 lakh budget has been the most popular in these major cities. The trend suggests that it’s going to remain in that bracket for little longer. Well, now it’s time for us to learn more about the preferred property type. In the case of Chennai, home buyers had equal liking for villas, independent houses and plots. However, there is a clear winner. Plots are the clear favourite as more than 48% responders went for it. The interest for apartments has been revived in a big way in the big cities. Most of the buyers are interested in buying it for self-occupancy. They didn’t buy it for renting it out to others. In the case of Pune and National Capital Region, the second spot went to plots. But in the case of Bangalore, row houses and villas secured the second spot. When it comes to the most cities, commercial properties, independent houses and villas recorded minimal interest from potential buyers. And we can understand the reason behind that. In big cities, people prefer apartments to other options for various reasons. Let’s study about the preferred construction stage for buying the house as well. When it comes to all the 5 surveyed cities, most respondents said that they are more interested in ready-to-move in within one year. As we have discussed earlier, buyers are looking for a space which they can occupy later on. For the same reason, they are looking for a property which is ready for possession within a year. People are not pleased with construction delays. It has been a major put off for most of the investors in all the cities. And that explains why they prefer ready to move in properties over the rest. Pre-launched properties also gained some traction in cities in Chennai, National Capital Region and Pune considering the monetary benefits attached to it. It managed to take the second spot in most of the cities. While in the case of consumers in Mumbai Metropolitan Region and Bangalore, they opted for a rather cautious approach. They preferred under-construction properties and it took the second spot in these cities. Pan-India results of the survey shows that real estate is still the top asset class in India. 88% of Indians believe that real estate is the best asset class that they should invest in. Yes, it is true. There is a fixed perception that real estate is a reliable investment option. And there has not been an incident that proved otherwise. So, we can easily understand why people voted for it. As per the survey, 72% assume that early stage of construction or pre-launch is the best option in terms of money. The price is relatively low at this point. They may have to wait little longer. But considering the monetary savings, most Indians find it very attractive option. No less. According to the 78% of the respondents, upcoming locations hold bigger promise compared to the prime localities. It could be because of the reason that prime localities don’t usually record sudden spike in prices. Whereas in the upcoming localities, things might get heated up due to some infrastructural development happening over there. And that means bigger gains in long term. Whether this argument holds true or not, this is what most people assume. 84% of the home buyers said that they used to wonder whether they had made a mistake or not after making a purchase. 46% of the home buyers have some serious issues with the developer. They have complaints that are never resolved. And the buyers assume in advance that they are going to be left disappointed. Let’s take the example of Bangalore. It’s the city of techies. These young, rich professionals are looking for buy a property in Bangalore. If they wish to know more about real estate in Bangalore, all that they need to do is to do a Google search on keywords like, “residential property in Bangalore”, “property websites in Bangalore” etc. And they will have all the information they seek. The scenario in Bangalore will tell you about the state of real estate in India. After the introduction of RERA Act, the confidence of investors in Bangalore has increased. Best residential projects in Bangalore offer premium villas and premium residential properties. But the crowd in Bangalore prefer apartments. You will come across property for sale hoardings all over the city, which is indicative of the flourishing real estate scene in Bangalore. Real estate websites feature Bangalore properties prominently. The scenario in Bangalore will tell you that there is no dull moment in property investment in the metropolitan regions. If you are looking for a property in Bangalore, you should definitely check out what Indya Estates have to offer. Yes, Indians still consider real estate as the top asset class. Until a strong competitor comes into the picture, real estate is going enjoy its rightful place under the sun. It has its issues. But those issues are not strong enough affect the growth of the industry. Previous Post How Affordable Housing Drives The Growth Of Indian Real Estate Industry? Next Post Planning to Buy a Property in Bangalore? Here are Some of the Best Locations to Consider!